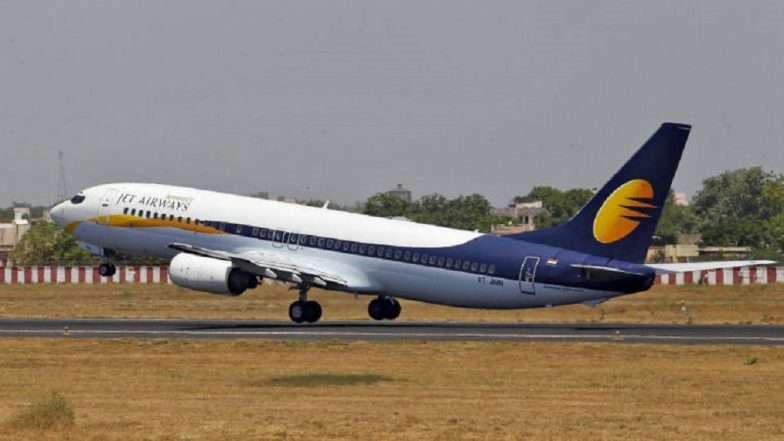 New Delhi, April 14: The National Aviators' Guild, the union of Jet Airways pilots, has deferred their strike which was scheduled to begin on April 15. The decision to postpone their agitation was taken in view of the "crucial meeting" between the management of the cash-strapped airlines and the State Bank of India (SBI). The meeting's outcome will determine the fate of Jet Airways, which is on the verge of being grounded. From nearly 200 planes operated by the carrier in its heydays, it down to only 7 domestic flights. Jet Airways Stops Forward Booking for East-Bound International Sector. The Jet Board has demanded the state-run lender to grant a Rs 1,500 crore immediate loan to rescue the airline. "There is a critical meeting tomorrow with airline management and the SBI. In light of meeting, members have requested through their Team Leaders that call of No Pay No Work be deferred to give airline a chance of survival," said the statement issued by the Guild. "Accordingly, as requested, the Committee would like to inform all, that the decision stands deferred for the time being," it further added. The announcement came hours after nearly 1,100 pilots affiliated to the Guild said they would not be flying tomorrow over the non-payment of outstanding salaries.